Hearing that your child has a vision problem isn’t easy, but most respond well to treatment. Discover why three eye problems develop in childhood and how they can be treated. What causes them: Tears normally flow from small openings in the inner corners of your baby’s eyelids into a duct that empties into the nose. If a tear duct is blocked — usually because a membrane can’t open properly — then tears well up and overflow down the cheek. The baby’s eyelids redden, and a yellow-green discharge keeps them stuck together. What to do: Most blocked tear ducts clear spontaneously before babies turn 1. You can gently massage the tear ducts at home to help keep them open. Your pediatrician can also prescribe antibiotic eye drops or ointment for the discharge as a temporary measure. If tear ducts are still blocked after your child’s first birthday, your doctor may suggest a minor outpatient surgery to open them up. Sometimes a tube, or stent, is implanted to prevent the problem from returning. Crossed eyes (strabismus). This can happen when the brain turns off images from the weaker eye to avoid double vision. Over time, one eye can lose the ability to “see” small targets. Nearsightedness, farsightedness or astigmatism. 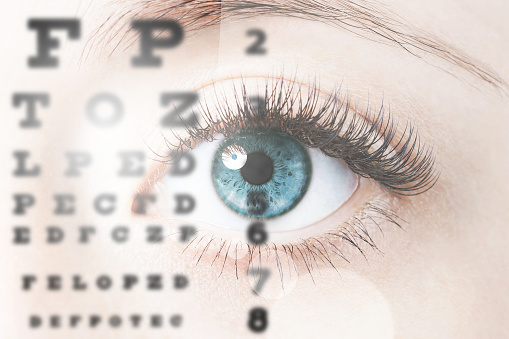 These vision correction problems can make the brain favor clearer images from one eye. Blurry images. A hazy cornea or lens, or a problem with the retina or optic nerve can make this happen. What to do about it: To help correct lazy eye, a doctor may suggest using a patch or dilating eye drops to strengthen vision in the weaker eye. Wearing glasses can sometimes correct vision in the weaker eye as well. Your pediatric eye doctor will sometimes recommend surgery to help the eyes line up properly or to clear the haziness from a cornea or lens. “In most cases, amblyopia is a preventable condition that is much easier to treat the younger the child is diagnosed,” says Dr. Babiuch. The earlier treatments are done — ideally, by age 8 — the faster a child’s vision will recover. But doctors can often help older children, too. Their eyes turn inward or outward constantly or frequently. Surgery will straighten the problem eye so that both eyes can work together. They have residual crossing with glasses. Because the brain, and not the eye muscles, controls eye movements, some children need further surgery. Genetics. About one-third of childhood cataracts are caused by a gene inherited from a parent. The parent may or may not have symptoms. Eye injuries. Clouding can occur as a result of inflammation or trauma within the eye. Diseases. Metabolic, inflammatory or infectious diseases (such as diabetes and galactosemia) can cause cataracts. Medications. Chronic use of certain medicines (such as steroids) can cause cataracts. What to do about it: If a cataract interferes with your child’s vision, the clouded lens must be surgically removed. The lens can be replaced by an artificial intraocular lens (IOL) implant. IOLs have become so safe and effective for adults with cataracts that pediatric eye specialists are using them in older children. While glasses (or contact lenses, if age-appropriate) can also correct a child’s vision, the implants provide clearer, more normal-sized images. Your pediatrician will screen your child for vision beginning in infancy. If there are serious childhood eye problems in the family, your child may be referred to a pediatric ophthalmologist for further evaluation and care.